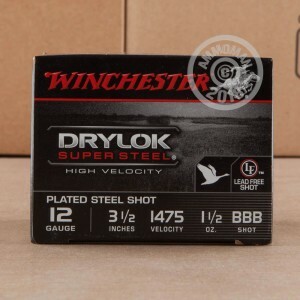 These large 3-1/2" shells from Winchester's Drylok Super Steel series are an excellent choice for hunting large waterfowl. Each shell in this box of 25 fires a 1-1/2 oz. payload of BBB shot at a muzzle velocity of 1,475 feet per second, throwing up a dense hail of steel shot that's sure to down your target with one well placed pattern. This ammunition has several features designed to make your hunting trip more enjoyable. These include a water resistant Drylok Super Steel wad and lacquered primer, both of which help protect the integrity of the shell in aquatic environments. Like other Winchester products, these shells are loaded in Oxford, Mississippi, the primary location of the company's ammo operations since 2011.